Carrying a 406 MHz emergency beacon (ELT, EPIRB, PLB) is one of the most effective and reliable means to make sure you are rescued promptly. A week hardly goes by without proof of just how effective and efficient they are. Yet, nobody knows how reliable they really are. How confident are you that yours will work if needed? No need to wonder anymore. 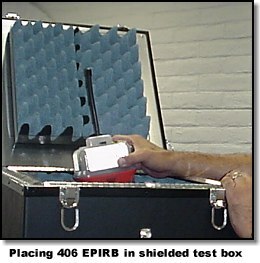 The U.S. Coast Guard recently completed the deployment of 406 beacon test kits to locations around the U.S. They are now offering you the chance to get your beacon tested--for free. We commend the Coast Guard's initiative and urge you to take advantage of this opportunity. Below we've listed the test kit locations, along with the name of the person, with their phone number, that you need to contact to make an appointment. You can't just show up unannounced and expect to have your beacon tested. These test kits are often in the field being used for inspection of commercial fishing vessels, their raison d'être. You must make an appointment for testing. Is there a problem? Coast Guard Lt. Cmdr. Paul Steward, who is in charge of this program, noted, "nobody knows for sure--yet." Despite all the success stories, rumors of 406 EPIRB failures have made the rounds and "anecdotal evidence suggests that they may not be 100% reliable," said Steward. Of course, that should come as no great surprise. They are, after all, a sophisticated piece of equipment comprised of all sorts of electronics and mechanical bits and pieces. Actually, what would be surprising is if they didn't fail on occasion. Yet, we expect lifesaving equipment to be ultra-reliable, for obvious reasons. The closer to 100% reliable we get, the better we feel. One of my great frustrations is having to rely upon the internal self-test mechanism on these beacons. Unlike the old-fashioned 121.5 MHz beacons that are being phased out, you can't just turn it on and check it for proper operation with an appropriate radio receiver. However, that self-test mechanism, no matter how well conceived and executed, is itself subject to failure, as has been discovered on all manner of equipment. So, when the self-test light illuminates, I've never gotten that warm and fuzzy feeling I prefer to have when dealing with equipment upon which I am trusting my life. When we started looking into this matter, we discovered that nobody really knew how reliable, or not, these 406 beacons are. The manufacturers certainly aren't going to necessarily be all that forthcoming if they are having a problem, and there was no independent source of information. As Steward explained, this is the situation that prompted the Coast Guard to initiate a study into the matter. The idea was to test units in the field to see if they functioned correctly. This is more involved than you might suspect. It takes a pretty sophisticated (and expensive) piece of equipment to determine if all the parameters are correct and to read and decode the digital data stream, along with a special shielded container that ensures the beacon's signal is not picked up by the COSPAS-SARSAT satellites. Initially developed as a pilot project two years ago, the study has since been expanded and the test equipment improved. Steward said, "it was originally targeted solely at the U.S. commercial fishing fleet, for the simple reason that they had most of the 406 beacons in existence." That's a side-effect of being forced to carry them by regulation, don't want to give those folks any more credit for common sense than they are due. Steward reports that "of the 60,000+ 406 MHz beacons registered in the U.S. (as of August, 2000), approximately 40,000 of them are EPIRBs (Emergency Position Indicating Radio Beacon) on commercial fishing vessels and 6,000 on other commercial vessels. There are approximately 13,000 406 MHz EPIRBs registered to recreational vessels in the U.S." By default, the remainder would be would be ELTs (Emergency Locator Beacon) used on aircraft and PLBs (Personal Locator Beacon, not yet legal in the U.S. except in Alaska). Steward explained that the test kit is used by "placing the beacon in the test box and activating the beacon (turning it on as you would in a distress)." The box shields the signal from transmitting to the satellites. 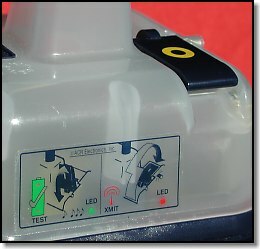 The hand-held analyzer/recorder is attached to the box and receives and downloads the signal and then deciphers it. This device "checks to see if the beacon is operating within the acceptable frequency band (406.20-406.30), that the hexadecimal I.D. code is correct, gives the country of registry, and confirms that the 121.5 MHz homer beacon is operating properly (among other functions which are read)," said Steward. If the beacon fails on any of these test parameters, it is re-tested up to five times over a 20-30 minute period. This is necessary because some EPIRBs take up to 20+ minutes to "warm-up" - this warm-up period gives the beacon time to tune to the proper frequency and stabilize its broadcast - both international (COSPAS-SARSAT) and U.S. regulatory requirements allow for this warm-up period. Steward explained that "if the beacon doesn't pass all the parameters of the test, even after multiple re-tests, the owner is informed that the beacon might not be operating properly, and that they should contact the manufacturer for advice and possible servicing." Initially, some Coast Guard stations were more enthusiastic about the program than others. San Diego was one of the busiest and best test areas due to the eagerness of the command and the USCG Auxiliary there to promote the testing to the maritime community, including non-commercial owners. In other areas non-commercial owners have been ignored for the most part. The Coast Guard recently completed the deployment of their upgraded test kits to locations around the U.S. With the program running smoothly, and with lots of queries from non-commercial owners of these 406 beacons (and more than a little encouragement from yours truly), the Coast Guard is now offering anyone the opportunity to get their beacon tested. We think that's a very good idea and urge you to take advantage of this opportunity. The testing is free, so there's no excuse not to do it. However, you can't just show up unannounced and expect to be able to have your beacon tested. These test units are often in the field being used for commercial fishing vessel inspections. You must make an appointment for testing. Below you will find the test unit locations, along with the name of the person, with their phone number, that you need to contact to make an appointment. Again, you must make an appointment. If this program is abused, it could be canceled, so please cooperate and be courteous. Office of Search and Rescue - Washington, D.C.
© 2000 Douglas S. Ritter & Equipped To Survive Foundation, Inc.